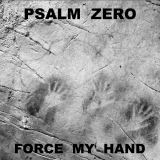 Force My Hand opens with the slightly blackened industrial prog of the title track, clean vocals coming as a surprise and a pleasant one when you realise how well they work. Having something of a Toolish vibe due to the guitars and the mechanical (I'm assuming programmed) drumming, the industrial tone to the track increases when the harsh vocals start, ending suddenly. The following Willpower is a cover of a Today Is The Day song – re-imagined as a neofolk dirge, all acoustic guitars and monotone vocals. It's quite eerie, and grows on you; those who have heard the original (and if you haven't, look it up; really should get around to reviewing some TITD...) will be aware of how different it is and what a good cover it is. If you're new to them, however, it'll likely leave you cold.